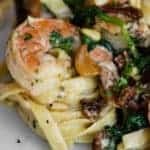 Creamy Sun Dried Tomato Shrimp Pasta is a decadent dinner recipe that combines flavorful sauteed shrimp with spinach, pine nuts, and homemade alfredo sauce. Cook pasta in large pot of salted water. Reserve about a cup of the cooking water to thin sauce later, if needed. Drain and set aside. While the pasta is cooking, you can make the alfredo sauce in one pan and the shrimp in a separate skillet. For the alfredo sauce, add butter and garlic to a saute pan and heat over low heat. Allow to cook until the butter is infused with the garlic, about 5 minutes. Add 1 cup of heavy cream, stir, and allow to come to a simmer. Increase heat to medium, if needed. Cook for 5 minutes, stirring occasionally. Remove from heat and immediately add in parmesan cheese and remaining heavy cream. Stir to combine. It will take several minutes for the cheese to melt. It will look goopy at first and then the sauce will be creamy and smooth. If sauce needs to be thinned, add additional heavy cream or some of the reserved pasta water. Stir in sun dried tomatoes, toasted pine nuts, and spinach. Spinach will wilt in hot sauce. To make the shrimp, melt butter with olive oil over low heat in large skillet. Add garlic and sauté until garlic is infused and fragrant, about 5 minutes. Add wine, salt, red pepper flakes, and freshly ground pepper and bring to a simmer over medium heat. Let wine reduce by half, which will take a few minutes. Add shrimp in a single layer and sauté until they just turn pink, 2 to 4 minutes each side depending upon their size. Stir in the parsley and lemon juice. To serve, toss hot cooked pasta and shrimp in sauce sauce and serve immediately.